Adding gauges to your Focus has never been easier!!! Swap out for stereo in a matter of seconds. Perfect for full time race cars, or toss in just for your weekend at the races. Easier than installing a pillar pod, and doesnt carry the “ricer” stigma or penchant for theft. Also keeps the competition guessing… Let your tail lights tell the story. Includes molded bezel that not only provides support for the gauge plate, but also provides a convenient pocket, something sorely lacking in stripped out race cars (somewhere to put your timeslips!). Gauge plate precision CNC machined from 5052 Marine Grade Aluminum. One side features a high mirror polish, the other side is reversible to a mill finish that can be used as is or painted to your liking. Includes Ford OE Plug in wiring harness so ALL power, ground, illumination, and even dimmer control wiring is complete. You need only connect a max of 3 signal wires and/or feeds for use, and we will even include crimp quick disconnects for those electrical connections. Designed and tested for ALL AutoMeter 2 1/16” gauges. 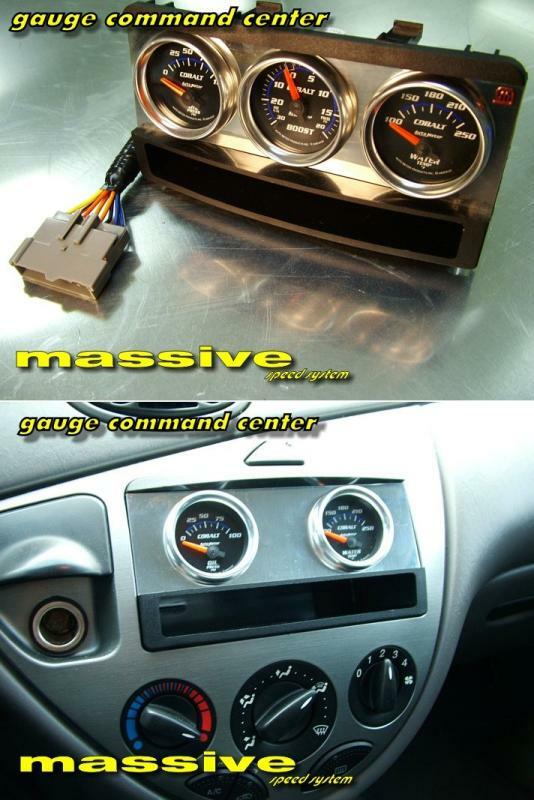 Other gauges may fit with modification. Available in double and triple panels. Fits all standard 2 1/16 Inch gauges.